Seaquest Motel Seaquest Motel - Willapa Bay; South Bend WA, the Oyster Capital of the World. Quaint and historical. Hiking, biking, birding and fishing. 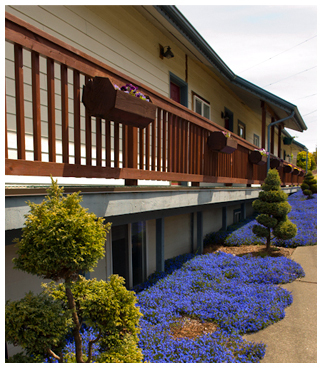 Nestled in the charming and quaint town of South Bend, known as the Oyster Capital of the World and the county seat of Pacific County, Seaquest Motel is the perfect place for visitors to enjoy the unique Willapa Country. Right on the waters edge of Willapa River, the town and surrounding area offer a host of activities for all ages including hiking, kayaking, birding and fishing. The centerpiece of South Bend is the Bush Memorial Park and War Memorial depicting South Bend native Robert Bush serving his country during World War Two. The park is adjacent to a new recreational dock and kayak platform, where you can tie your boat up for a small daily charge, putting you near Pioneer Grocery and deli, South Bend Pharmacy, the South Bend Coffee Co., Hamp's Restaurant and several great shops! An informational kiosk is also in the park, providing history of the area, South Bend in the present and some future plans for the area. The Historic Pacific County Courthouse retains original fixtures and lighted Tiffany glass dome 29 feet in diameter. Other nearby attractions includes the Pacific County Historical Museum. The town has recently built a boat launch and spacious truck/trailer parking lot. Not a block from the motel Chinook, Coho, Sturgeon and Steelhead roll by! "Great place to stay and close to the best BBQ oysters in the world!"